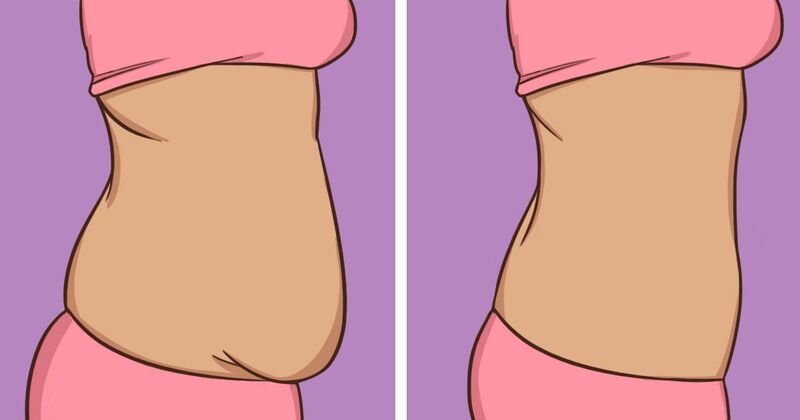 Here’s the honest truth: To lose belly fat, you need to burn more calories than you consume, ideally through a healthy diet and a combination of core-strengthening exercises and calorie-burning exercises. The strengthening exercises will help build and tone, while the calorie-burning exercises will help reduce overall fat, including your stomach area. As LiveStrong discusses, there is no such thing as spot reduction, meaning you can’t just target one specific section of your belly. You must work your whole core to see progress. Below you'll find the eight best exercises to help you achieve the flat belly of your dreams. These exercises will have your core muscles burning and your forehead sweating – especially if use them together in a workout. These exercises focus on the whole core and are a combination of strength-builders and calorie-burners. Crunches are old school, but the key to using them is to keep going until it burns! Lie down on your back with your knees bent at a 45-degree angle. Place your hands across your chest and crunch upward, lifting only your upper back off the ground. Leave your lower back on the ground. Then come back down, but just before your shoulders touch the ground, crunch upward again. Throughout the movement, do not relax your abdominal muscles but keep them consistently tense. The faster you do mountain climbers, the more calories you will burn! Start in a high plank position (pushup position), with your hands under your shoulders, toes on the ground, bottom down and your body rigid. Bring one knee in to meet the opposite elbow and then the other knee to meet the other elbow. Pick up the pace and do this exercise as fast and controlled as possible. Like crunches, the key to oblique crunches is to keep going until it burns! Lie down on your side so that one leg is on top of the other. Bend your legs slightly and prop yourself up on one elbow. Then start to crunch upward, bringing your knee to meet your elbow. Make sure to tense your oblique muscle throughout the whole movement. Then swap sides. If you keep your core super tight during this exercise, you can target all of the core muscles! Start in plank position with your forearms on the ground, your body rigid and your bottom down. Begin with your feet together, and then jump them outward and back together. Keep your abs tensed throughout the sets, and try to keep at a high intensity. This exercise targets those stubborn lower abs! Lie down on your back with legs extended and hands by your side. Slowly raise your legs up until they reach vertical. Once they reach vertical, continue lifting until your hips also come off the ground. Then slowly bring your legs back down, but before they touch the ground, raise them back up again. Make sure you keep pushing your back into the ground so that it does not arch during the movement, and keep your abs tense throughout the whole set. The faster you reach, the more calories you burn! Start by lying on your back with your legs bent and feet flat on the ground. Then lift your upper back off the ground and curl your torso to the right, extending your arms by reaching across your body to your right foot. Return to the starting position and repeat on the other side. This move is challenging, so if you need help keeping your balance, place one foot in front of the other. Lie down on your side, with one foot on top of the other. Place your hand directly under your shoulder and lift your hip off the ground so that you are in a side plank. Lift your hips up toward the ceiling as high as possible and then return to the original position. Do not allow yourself to rest between sets. Keep the burn! Start by lying on your back with your legs bent and feet flat on the ground. Place your hands behind your ears. Then slowly bring your knees in toward your chest and at the same time lift your shoulders and upper back off the ground. Return to your original position. So create a core workout from these awesome eight exercises. Over time, this workout will help you reduce body fat, build a strong core and achieve that bikini belly you have been dreaming of. Enjoy! Never underestimate the powerful effects of water. Snacks are far from off limits when it comes to watching your figure. Take a look at these 10 snacks that promote fat burning.